I have this nifty visitor tracking system, that lets me see how people browsing my blog came here. And since I’m already high up in Google’s rank, possibly because I’m situated under 8bitcollective.com, I get quite a few search engine referrals. 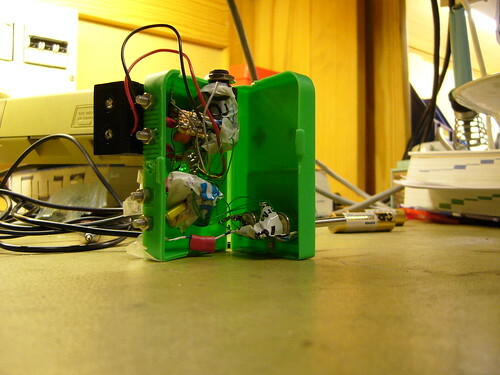 Moste people who come here search for something things related to Gameboys, for example Gameboy circuit bending, but appearantly one person got here just a few minutes ago by googling for tetris comic. And I will take this opportunity to show what else among the results. 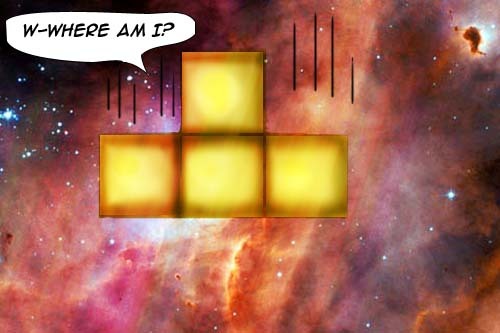 A comic taking on a more philosophical view of Tetris. (Made by Kristen Gudsnuk and originally posted here.) Update: Kristen left a comment and informed me that he (she?) only drew the falling block, while someone called “Terminal” put it in the celestial context it’s in in the picture. Did I get it right? If you’re a Tetris lover, this is a must-see. To some people’s standards it may be slow, but it works fine for me. But something that annoys me is that every 2-3 months or so, the graphics chip goes crazy and totally glitches out. Even after rebooting, the image still gets glitched. The only thing that seems to work is to change the graphics driver, and then change it back. Oh yeah, Limewire? No thank you, it’s probably one of the worst p2p clients I’ve used. Eats memory and CPU, and on top of that it has crap results. It’s just there because I was convinced by a friend to try it. This is a weird little thing that I stumbled across during today’s random browsing. A Christmas ad with a (cartoon) kid in the shape of a Gameboy who wants a gift card so he can buy all the games he doesn’t dare to ask santa about. And in the end he makes some moves that suggests fapping. Hilarious. I originally found this on TheBBPS.com, so pay them a visit! I don’t really have any expectations on the board, it’s just an act of impulse, so I’ll see where it leads. If people abuse or if nobody posts, maybe I’ll shut it down. Anyway, here it is: http://www.anonib.com/gbgenius. So have a look and maybe contribute if you feel, and I’ll see how things turn out. So I decided to try Coca Cola Zero for a few days and see what I though about it. Coke Zero is based on aspartam and acesulfam k, which as far as I understand is the same sweeteners as the pre-sucralose diet Coke. So in a way Coke Light could be seen as a modified version of that. My theory is that the CC company realized their mistake with sucralose, but couldn’t recall it because of pride for their trademark. Coke Zero also has a weird effect when it comes to its carbonation. When opening a can of diet soda, there seems to be more pressure in it, and diet sodas seem to be more explosive when it’s been shaken. And diet sodas also seem to produce more foam, both when pouring it in a glass (Where the foam takes a ridiculous amount of time to settle) and when drinking from the can (Where the foam fills your mouth) The myth (?) that artificial sweeteners are in fact soap are not only related to the taste. Alas, it seems like Coke Zero, just like any other diet drink, is either more carbonated than regular sodas, or that this effect is caused by the sweeteners. What about the taste then? Obviously better than diet Coke. And even a pinch better than the old diet Coke. But it still has a very clear texture of sweeteners, and also leaves the regular after-taste in my mouth, but less than either other two types mentioned. In my opinion it’s a fully acceptable drink when drunk with food, which masks the sweeteners pretty well. Coke Zero still not my preferred way of ingesting caffeine, but I’m pleased to see that Coca Cola did a diet drink somewhat ok.
Suits my way of thinking. Found at The Perry Bible Fellowship. We went to Tantolunden, a pretty big field in the outskirts of Stockholm, where alot of kids hang out during spring and summer. 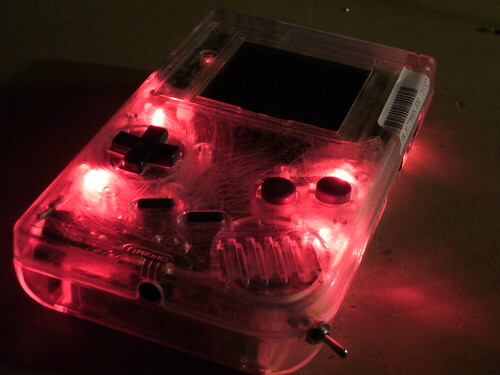 When I plugged in my Gaemboy (Which has internal lights, as you may know) people went crazy. They wondered where the hell the sound came from, and they were even more amazed by the vast geekiness behind a transparent machines, numbered 1787568 and 1787569. There was one minor annoyance, the police showed up. But the swedish police has a soft surface. (Not that they can’t beat people up just like any other police force, but they try to be friendly with the kids) They hung around for an hour so, really only to make sure we kept the volume of the sound down, because some of the people in the houses around the area had complained. Anyway, here are some pics form the night, courtesy of Rasmus Fleischer. If you have more pictures from the night, give me a shout. 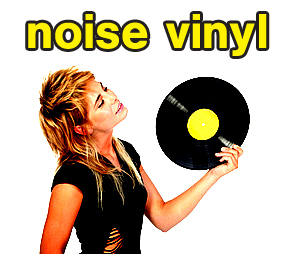 The Minimalizm Noise Vinyl v3 is a locked groove vinyl project. 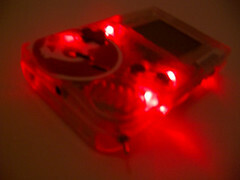 A locked groove vinyl is a vinyl disc where every track keeps looping. The disc has a number of circles, one for each loop, rather than a long spiral. The aim of the project is to do community pressings, where every artist makes a loop for the vinyl and orders a few copies to pay their share of the production. 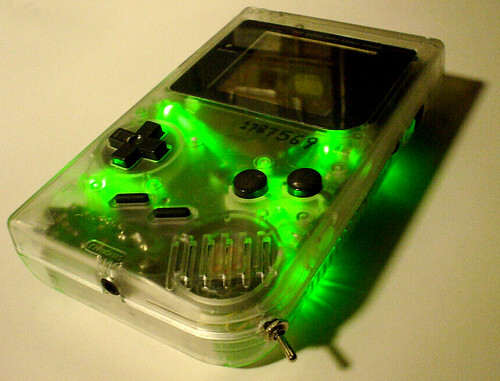 My contribution to the project is a Gameboy loop. As a bonus, you get a house track by LeAndre from Paris, and the 53 loops from minimalizm v2 on the B side. 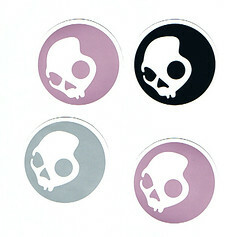 The original minializm v2 pressing was pressed in 100 copies which were quickly sold out. Because of this high interest minimalizm v3 is now available to the public. By buying one or more copies of the vinyl, you support the project and ensure there will be a 4th vinyl when the time comes. 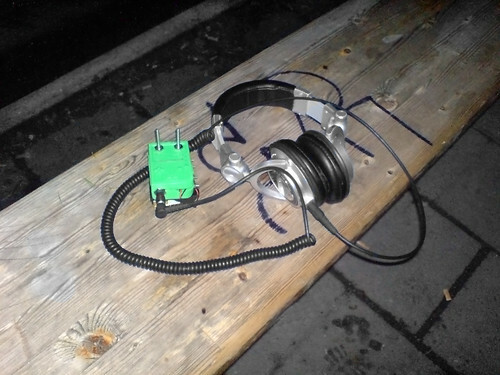 Not much to say about them, clear treble, crunchy mid-range, not blasting, but at least very much audible bass and sub-bass. 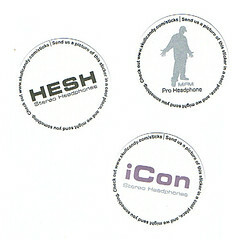 The interesting thing, however, is that they came with small stickers, that they reuqested people to put in cool places. 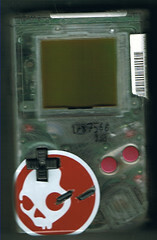 Viral marketing, yes of course, but I decided to put one of the stickers on redledboy, my LED-filled transparent Gameboy. Unfortunately, since my camera is back to the shop for repairment, and possibly replacement, I tried a friend’s camera and I tried putting the GB on the scanner, all without much success. I just couldn’t get the pictures as I wanted them. These are probably the two best ones, with respect to how I wanted the photo picture to look. The other pictures are available on my flickr account. But that’s a later problem. This Swedish post was meant for a couple of guys I met on a subway station. For you English speakers, this blog will mainly be in English, and anything of interest in this post will be covered later on in the blog. … som låter så här. This page was previously hosted on http://gameboygenius.8bitcollective.com/wordpress/2007/04/ (*).